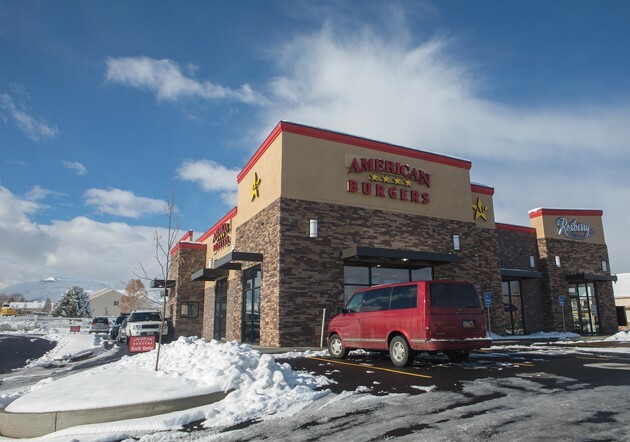 American Burgers has grown from two locations in Tooele County to a location in Herriman. The charbroiled burger franchise has plans to expand into Utah County. Angelo Geovjian works in the front end American Burgers in Herriman. The restaurant has recently opened a store in the Salt Lake County location and has plans to expand into Utah County. 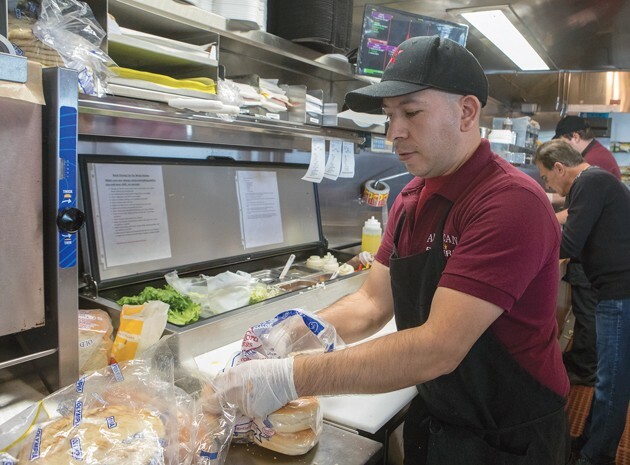 Servio Saldana prepares orders during the lunch rush at American Burgers in Herriman. Saldana has worked at the Tooele location and now works at the Salt Lake location. American Burgers just got bigger. Not the size of their patties or buns, but the local owners of the burger and Greek food restaurant opened a third location in Herriman about a month ago. 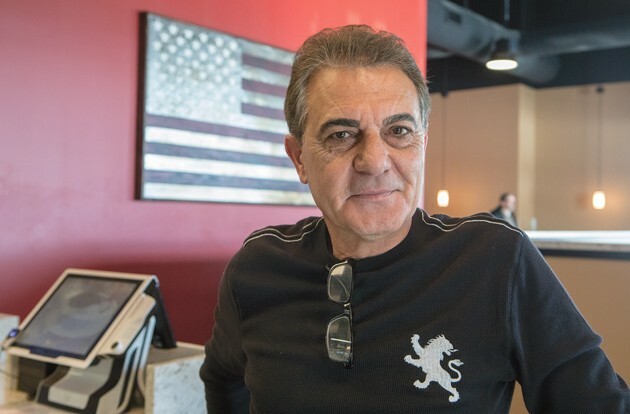 Angelo Geovjian, his sister-in-law Mary Manusakis Geovjian, and her husband, Toro, own and operate American Burgers in Tooele City and Grantsville. 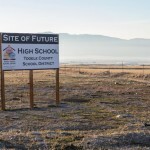 The three Tooele residents and business partners have been thinking of expanding into Salt Lake County for some time, but it wasn’t until fate connected Mary Geovjian with a Herriman developer that things took off. Mary Geovjian said she saw a piece of property that looked like a good place for an American Burgers restaurant. 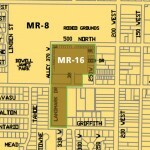 The Geovjians invested an undisclosed amount of money and built a three storefront pad in Herriman Corner on Rosecrest Road in Herriman. One storefront is occupied by American Burgers, another is home to a Roxberry Juice, the third storefront is available. The Herriman American Burgers has the same exterior and interior design elements as the Tooele store, which was remodeled in 2016. This was the first time the Geovjians opened an American Burgers in a newly constructed restaurant. The Tooele restaurant, the Geovjian’s first, opened in 2000 inside a former Kentucky Fried Chicken. It was remodeled and the eating area expanded in 2016. In 2010, the Geovjians opened the Grantsville American Burgers inside a building that had housed a fast food business. The Geovjians also own Java Bean, a coffee and sandwich shop in Grantsville that they opened in 2012. The cooking line in Herriman is 27-feet long, compared to 17 feet in Tooele, he said. The eating area at Herriman is a little larger to accommodate the larger capacity of the longer cooking line, according to Angelo Geovjian. The Herriman restaurant, which includes a drive-up window, is 27,000 square feet — about 2,000 square feet larger than the Tooele American Burgers restaurant. The contractor for the Herriman American Burgers was Northpoint Construction, a Bountiful, Utah, based contractor. The architect was Paul Nielsen of Order Architecture in Murray, Utah. “We can fit six or seven cooks on the line in Herriman and four in Tooele,” Angelo Geovjian said. The hardest thing about opening a new restaurant wasn’t the building, but hiring and training the staff, according to Angelo Geovjian. The American Burgers in Herriman employees 30 people, including a general manager and two assistant managers. The general manager for the Herriman restaurant was hired and brought in to work and train at the Tooele store several months before the Herriman store opened. 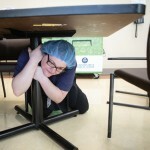 One key position at the Herriman location went to an experienced American Burgers employee. According to Angelo Geovjian, he and Mary Geovjian, along with American Burgers’ manager and trainer Colton Harris, make frequent trips to Herriman to train staff and make sure customers are receiving the kind of customer service that American Burgers is known for. The menu is the same as the Tooele and Grantsville stores with charbroiled hamburgers — 17 varieties and sizes, including the namesake pastrami burger, the American Burger. The food selection also includes sandwiches, salads, shakes and more. There are no smoothies on the Herriman menu. That’s because they are available next door at Roxberry, Angelo Geovjian said. Mary Geovjian’s Greek heritage also shows up on the American Burger menu with pork and chicken sticks or kebabs, gyros, Greek salad and baklava. The new Herriman restaurant may be the first in an invasion of the Tooele born American Burgers chain along the Wasatch Front. The Geovjians are looking for markets, like Herriman, that don’t already have a charbroiled burgers and a Greek food option. The Herriman American Burgers is located at 13322 S. Rosecrest Road. It is open daily from 10 a.m. to 10 p.m.